Author(s): Neda Rohani, Fatemeh F. Bamoharram, Research Center for Animal Development Applied Biology - Department of Nanobiotechnology, Mashhad Branch, Islamic Azad University, Mashhad, Iran. Azam Marjani, Majid M. Heravi. Using photolysis method, Preyssler acid, H14[NaP5W30O110], was employed in the form of composite film as a green reductant and stabilizer for the synthesis of Au nanoparticles. The synthesized Au NPs/Preyssler film was prepared by a simple and fast sol-gel method and characterized by UV-Visible spectroscopy, particle size distribution, Field Emission Scanning Electron Microscopy (FESEM), and Energy Dispersive Spectroscopy (EDS) analysis. Our findings showed that Au nanoparticles were obtained at about 6-11 nm and were readily inserted and monodispersed in the nanocomposite film. The photocatalytic performance of this NPs/Preyssler film was examined in decolorization of methyl orange (MeO) in aqueous media. UV-Visible studies showed that Au NPs/Preyssler film can efficiently catalyze the decolorization of the aforementioned azo dye. The pseudo-first-order rate constants were also calculated for this reaction. Keywords: Decolorization, gold nanoparticles, heteropolyacid, nanocatalyst, photochromic film, preyssler. Affiliation:Research Center for Animal Development Applied Biology - Department of Nanobiotechnology, Mashhad Branch, Islamic Azad University, Mashhad, Iran. Keywords:Decolorization, gold nanoparticles, heteropolyacid, nanocatalyst, photochromic film, preyssler. 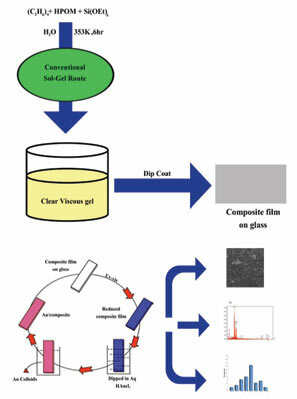 Abstract:Using photolysis method, Preyssler acid, H14[NaP5W30O110], was employed in the form of composite film as a green reductant and stabilizer for the synthesis of Au nanoparticles. The synthesized Au NPs/Preyssler film was prepared by a simple and fast sol-gel method and characterized by UV-Visible spectroscopy, particle size distribution, Field Emission Scanning Electron Microscopy (FESEM), and Energy Dispersive Spectroscopy (EDS) analysis. Our findings showed that Au nanoparticles were obtained at about 6-11 nm and were readily inserted and monodispersed in the nanocomposite film. The photocatalytic performance of this NPs/Preyssler film was examined in decolorization of methyl orange (MeO) in aqueous media. UV-Visible studies showed that Au NPs/Preyssler film can efficiently catalyze the decolorization of the aforementioned azo dye. The pseudo-first-order rate constants were also calculated for this reaction.